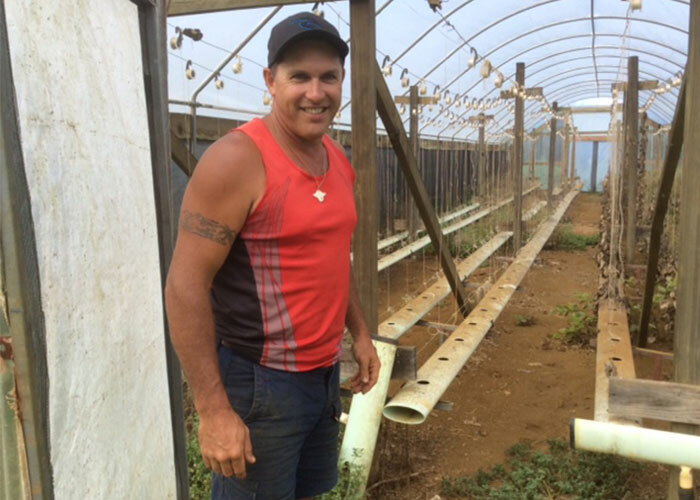 Matt Bigg has been a Nutrition Farmer since my first visit to Norfolk Island seven years ago. He immediately recognised the logic of solving problems, rather than the treatment of symptoms with chemicals. Matt also argues that vegetable growers should always be prepared to feed their produce to their own families. Unfortunately, this is not the case with many chemical farmers. They often have their own chemical-free garden to provide uncontaminated food to their loved ones. Matt produces fifteen chemical-free vegetable crops and a dozen organic fruit crops, on two Norfolk farms. He has developed a reputation for fine-flavoured, biological produce and the customers line up at the local farmers’ market to reward his efforts. Norfolk Island has recently been hit with a new insect pest. Psyllids had not previously reared their destructive little heads on the island. Then, about 12 months ago, a conventional tomato grower reported first contact with the invaders. Despite his attempts at chemical control, his tomato growing operation has now been seriously impacted. This insidious sap sucker has now made its way around most crops on the island. The local government is about to embark on an expensive eradication program that will envelop the island in toxic pesticides. It appears that the only growers who have escaped the plague have been those practising Nutrition Farming®, and Matt is the largest scale operator amongst the survivors. During my recent visit to Norfolk Island, I decided to visit Matt to investigate the dynamics of his resilience, in the face of this new challenge. Matt was in good spirits when we met. He has found that his production continues to improve with this common sense, nutrition emphasis. “I just stick to the program and things keep getting better,” he reports. 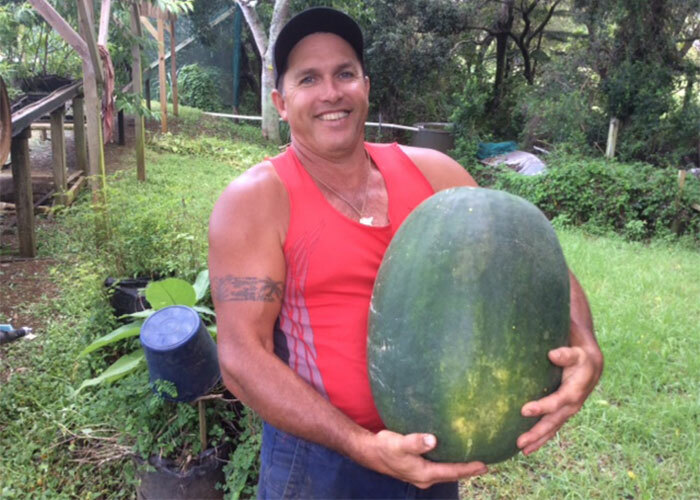 “This summer I have had the best yields of watermelons, rockmelons, cucumbers and tomatoes ever”. Norfolk Gold™ is a complete biological fertiliser in a compost base. We developed this living fertiliser after testing most food-producing soils on the island. We discovered five missing minerals in most soils and there is an emphasis upon these missing minerals in the Norfolk Gold™ formula. Triple Ten™ and Trio™, together, deliver complete foliar nutrition and they are the biggest selling NTS liquid fertilisers across the globe. Kelp and fulvic acid are biological essentials that promote plant growth, reproductive efficiency and resilience. There has been a team of agricultural scientists from Australia researching the new psyllid problem on Norfolk Island for some time. I enquired around the island and discovered that the researchers have recorded the highest pest pressure amongst chemical farmers with compromised soil life. 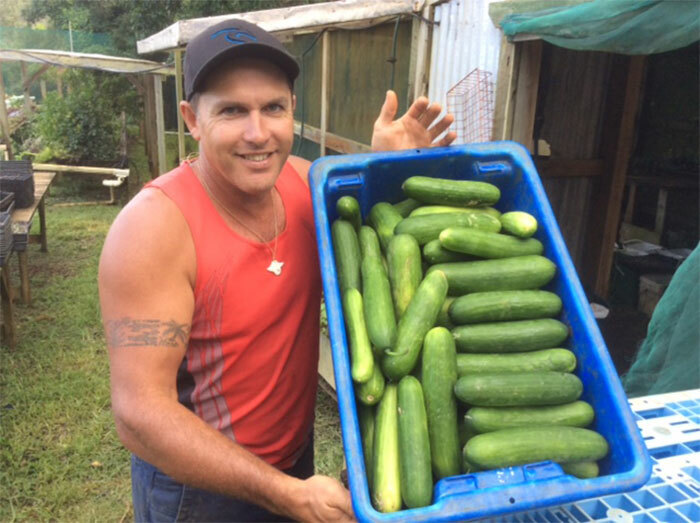 Part of Matt Bigg's multi-faceted operation involves two hydroponics sheds, where he grows tomatoes and cucumbers. He suffered recurring problems with whitefly recently and made the decision to abandon hydroponics and plant both crops in the field. He was delighted at the outcome. “I don't know why I didn't do it years ago,” he exclaims. “There is no power requirement, 80% less labour and much lower fertiliser costs, but the biggest thing was the plant health and pest pressure. I have had no further issues with whitefly, the yields are almost double and the fruit is 50% bigger.” Matt explains that the labour reduction and associated stress reduction was largely related to less management in pruning laterals and tying vine crops. Get a good soil test so you know what is happening in your soil. Matt explained that he has tested and corrected most of his soils and this is an essential component of precision nutrition and associated resilience.